More than a year after Russia and Georgia clashed in a short but brutal war, the two countries are continuing their dispute on the movie screen. Russian filmmakers have already released a slick documentary as well as a romantic feature that depicts Georgia as a genocidal aggressor. Now, the Georgian government is supporting Renny Harlin, the Hollywood director who made Die Hard 2, for its own take on the conflict, complete with Andy Garcia as the embattled Georgian President standing up to Russian tanks. Truth, famously, is the first victim in war. In the case of the Russia-Georgia conflict, the closest we'll probably get to the truth is an E.U.-led investigation that took more than a year to figure out who fired the first shot. That was Georgia, the report concluded, while also judging that Russia violated international law during the onslaught that followed. But don't expect to see any of that nuance in the films now battling it out to rewrite history. From the beginning, Georgia's press-savvy and Washington-backed President Mikheil Saakashvili, who has a law degree from New York's Columbia University, has been relentless in spinning the war as a product of Russian expansionism. He gave dozens of interviews to Western media even as the bombs were falling, and says that the upcoming film with Garcia will drive that point further. "Indeed right now the American director is producing a Hollywood film, and I am sure Russia is not depicted there in the best light," he told a gathering of supporters in Kiev, Ukraine, this month. "It's true Andy Garcia's previous role was in The Godfather [III], and his evolution from a Mafioso to the President of Georgia does not make for the best associations. But I think we will manage." Saakashvili said the big-budget film was not financed by the Georgian government. "We have enough trouble funding our local directors," he said at the Ukraine gathering, which TIME attended. But the author of the screenplay, David Imedashvili, tells TIME that the initial funding for the project came from a Georgian government fund. Projects like this, he said, give Georgia a rare chance to hit back at its bullying northern neighbor. "Georgia is a very small country, Russia is a giant," Imedashvili says. "It's idiotic to fight a war with Russia, but we have to do something. We have to defend ourselves in some other way." The film's executive producer, Mirza Davitaia, who is a parliamentarian and a member of Saakashvili's political party, echoed that idea. "This is our chance to show the whole world what happened here," he says in an interview. "It is based on historical facts." But Russia has a competing version of the facts, and has been paying millions of dollars to make sure the public hears it. 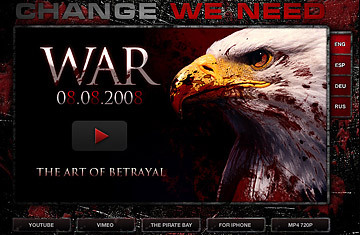 The first attempt, a graphic and slickly produced documentary called War 08.08.08: The Art of Betrayal, was released three months after the conflict. It argued that American mercenaries had helped the Georgian government commit genocide against the people of South Ossetia, a separatist region that Russia says it was forced to step in to protect. But the project fell flat. Narrated by Canadian George Watts  a former translator for Russian Prime Minister Vladimir Putin  its arguments seemed heavy-handed even to sympathetic critics, and the whole film has been viewed on YouTube  in either its Russian or its English versions  fewer than 12,000 times. A much more ambitious attempt to shape the war's history arrived in March with the release of Olympus Inferno, which aired on state-owned television. The drama takes a more subtle approach, depicting a clumsy American scientist who accidentally films Georgia's invasion of South Ossetia while studying a butterfly called, yes, Olympus Inferno. Though couched as a love story, the message is the same: the Georgian army went on a rampage against civilians last August, and the U.S. military helped. Much like his Georgian counterparts, the film's director, Igor Voloshin, insists that his work is a historical document as much as a work of art. "This film gives a very objective point of view," Voloshin tells TIME. "On the one hand it is a feature film, a work of art, but from the point of view of history, we did not lie." When asked where he had found objective truth in the muddied waters of the conflict, Voloshin said he did not need to prove anything. "Time will show who is right," he says. Perhaps it will. But just in case, Russia is looking to make another movie to shore up its version of the conflict. Renowned Serbian director Emir Kusturica declined the project last month following a meeting with its Russian backers in a Moscow nightclub. But don't be surprised if those behind the film sign someone else up and Russian moviegoers soon get yet another take on a familiar subject.